It would be easy to start this review off with a summary of the troubles director Roman Polanski has faced over the years, condemning him for his actions, yet praising his cinematic work, but forget about all of that. The real question is: can this man still make a movie? Polanski, of Rosemary's Baby and The Pianist fame, returns with The Ghost Writer, a political thriller bursting with intrigue and political themes that eventually gets sidetracked by its muddled tone, bad humor and been-there-done-that final twist. In case you're unaware, a ghost writer is a professional journalist who interviews somebody and writes their books for them. For instance, Bill Clinton's memoirs weren't necessarily written by him, but rather by another person who took what he said and turned it into prose. In the movie, Ewan McGregor plays one of these men, known only as the Ghost, and he is invited to write the memoirs of former British Prime Minister, Adam Lang, played by Pierce Brosnan, after his previous ghost writer was found washed up on shore. For a hefty fee of $250,000, the Ghost agrees to take the job and is quickly invited to live in Lang's house along with his wife, Ruth, played by Olivia Williams. While he is there, allegations of war crimes pop up on the news and the Ghost quickly realizes that there is more to this man's life than meets the eye. Hot off the heels of Scorsese's umpteenth masterpiece Shutter Island, The Ghost Writer feels like a number of movies mishmashed into one. What should have been an airtight political thriller becomes too oversaturated with goofy humor and chase scenes in the latter half that sometimes make the proceedings feel more like National Treasure than All the President's Men. This journalist all of a sudden becomes an action bound, conspiracy unraveler who figures things out in a split second that the FBI wouldn't for months. That's not to say I dislike humor and think all serious movies should be completely so, but the jokes in the film seem too self-knowing to really work in this context. At one point in the movie, the former Prime Minister's wife makes a joke about texting. I'm sorry, I wasn't aware this was a teen comedy. Later, the Ghost hops on a bike and his rear wheel sinks into the wet terrain he's traveling on, impeding his movement. This comes at a moment in the movie where he is finally starting to piece together what is happening and is heading off to the beach where the last ghost writer's body was found. I need not explain why that joke is out of place. My main beef with the movie, however, comes not from its poor use of humor or its sagging back half brought on by a spike in the action, but rather from its piling on of foreboding. The tension doesn't always flow naturally as it should in a political thriller. More than a few lines of dialogue eerily forewarn of the Ghost's impending danger, like one where a character tells him not to turn left in his car or he "might never be heard from again." While this could be fine alone, this is not an isolated incident and moments like this occur throughout the movie. I never felt like I should care based on what I was seeing onscreen, but rather from the constant reminder that something bad was going to happen being shoved down my throat. Nevertheless, The Ghost Writer raises some interesting themes of power, struggle and war crimes and relates them back to America, exploring our motives and questioning who really pulls the strings, but the provocative conversation that should have occurred on my car ride home became too focused on the glaring flaws to spark any real interest. 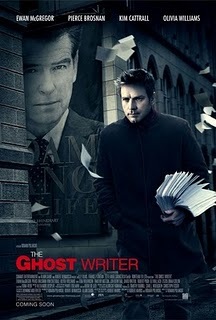 Despite a solid recommendation, I find myself disappointed with The Ghost Writer, a film that seemed destined for greatness, but ends up a throwaway thriller with minor thrills and little else.